Glide between your wing beats. I bought this new piece of ply-wood for $40 from the hardware store across town. I cut it into a few pieces. Not at all evenly, really not sure what sort of math I was using. Hawks to Eagles. 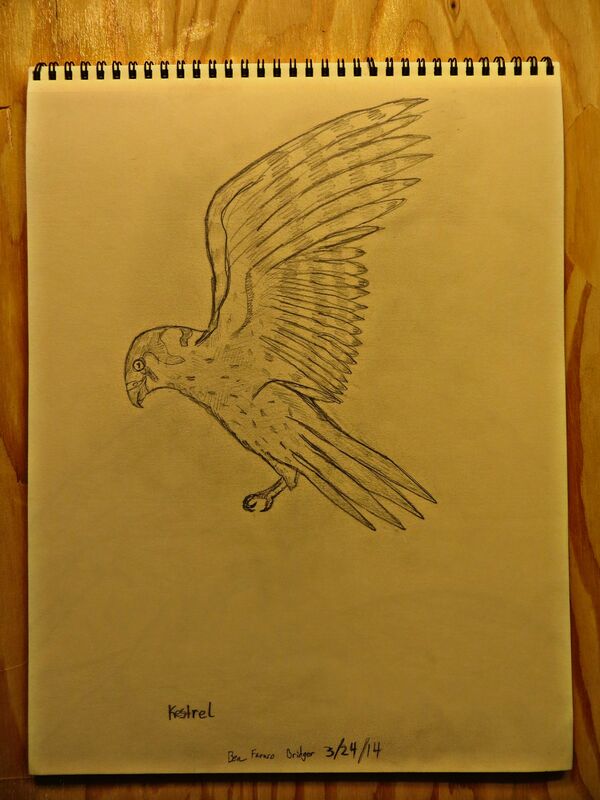 The Bald Eagle seemed a good starting point. 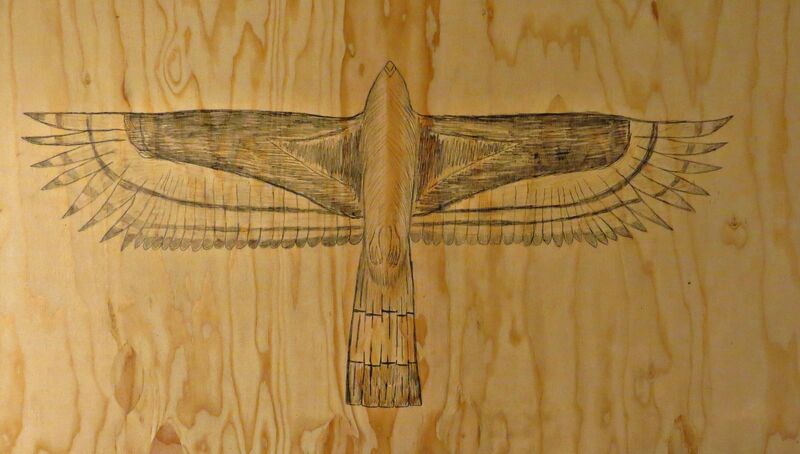 Here it is in pencil gliding between wing beats. How to trap a hawk with a #2 pencil. I cut and sanded the plywood over the tailgate of my truck out in the parking lot today after work. There’s still sawdust on the asphalt at 1am. The wind will take it soon enough I resolved. 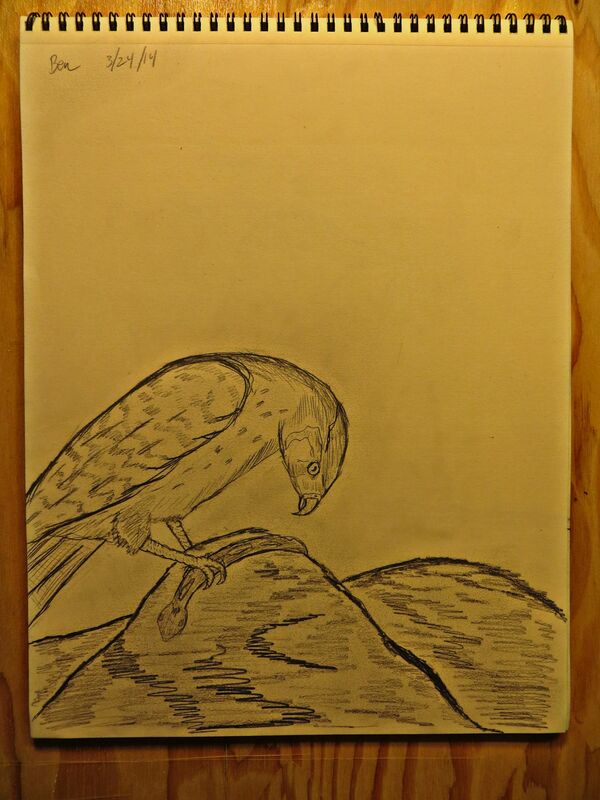 I used two Dixon #2 pencils to bring to focus the Hawk I was seeing in the wood grain. 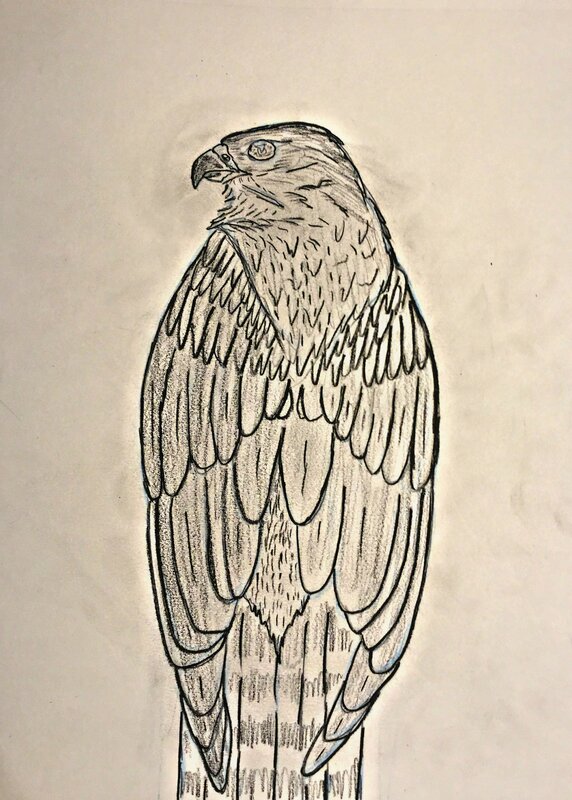 It’s a Zone-Tailed Hawk, native to southern California, Arizona, and Mexico. 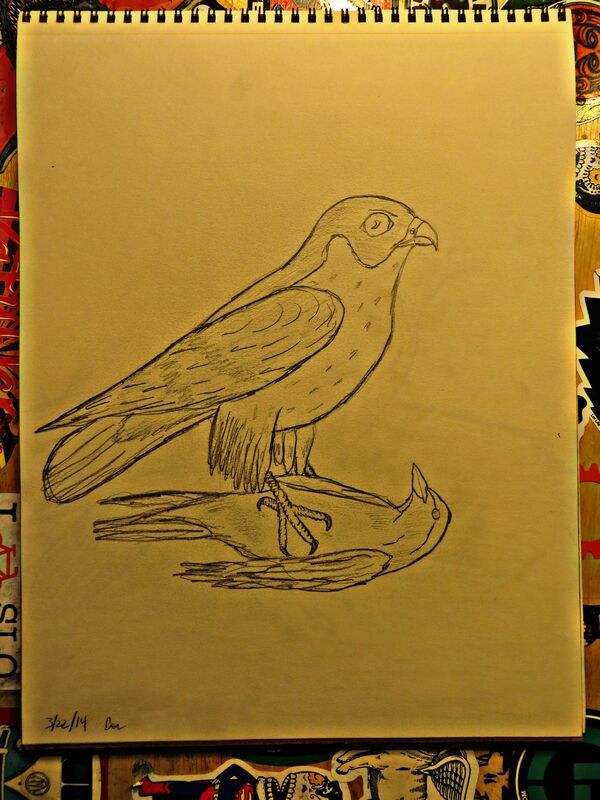 But another of many birds I’ve only seen in books, and my pencil work. 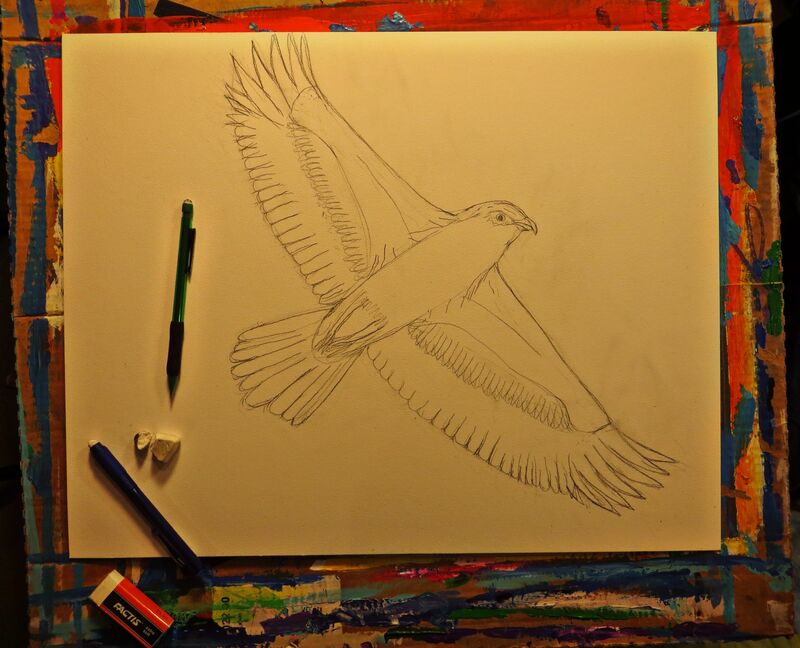 Gliding between wing beats, that’s how it will stay on this page. Until I set it loose in paint sometime not long from now. The Great Gray Owl has been of interest to me lately. The largest of our Owls in North America. They hunt over forest clearings and nearby open space by night. The rings on the face make the yellow eyes appear smaller. This was my initial sketch after just looking over a few photographs and books. Further studies will yield better illustrations I’m confident. 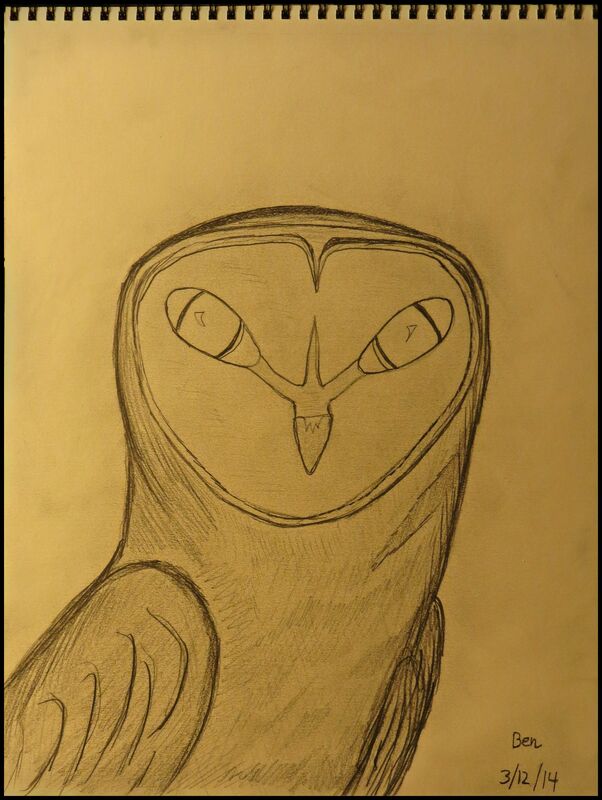 Two years ago when I decided I wanted to write and illustrate my own collection of birds, I was uncertain of my capabilities of capturing the nuances of the Owls. While I’m still far from mastering it, I do see delightful progress in the direction I desire. 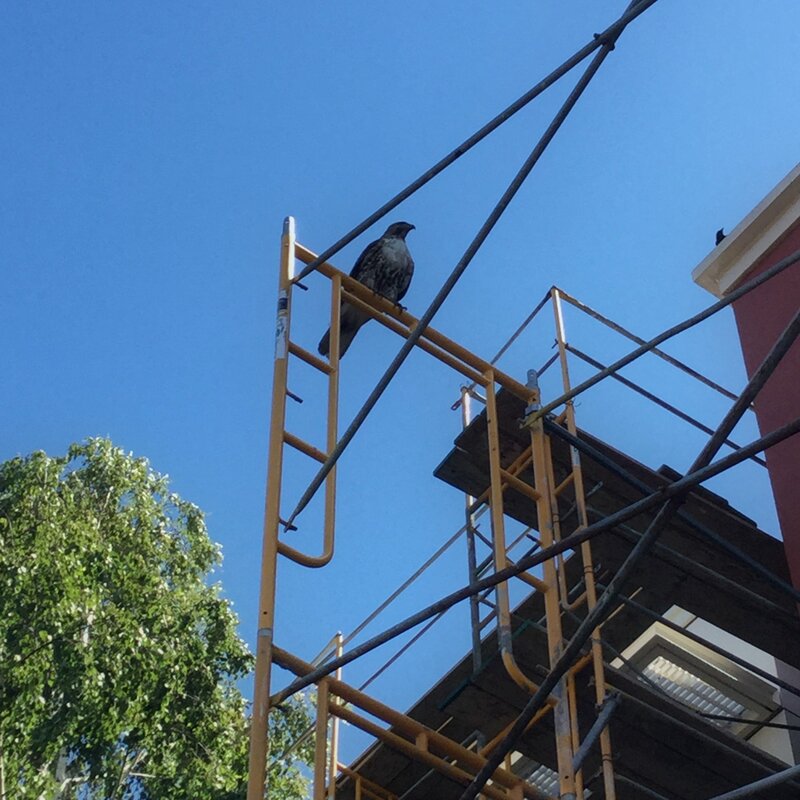 I don’t think it’s a stretch of the truth to say the Peregrine Falcon is an inspiring animal. While diving they’ve been clocked in at over 200mph/320kph. They look like little fighter jets with eyes and claws. My Father and I spotted a Peregrine on the Morro Bay rock this past weekend. This got me thinking about how to illustrate them in a fashion that shows some of their prowess, strength, and precision. 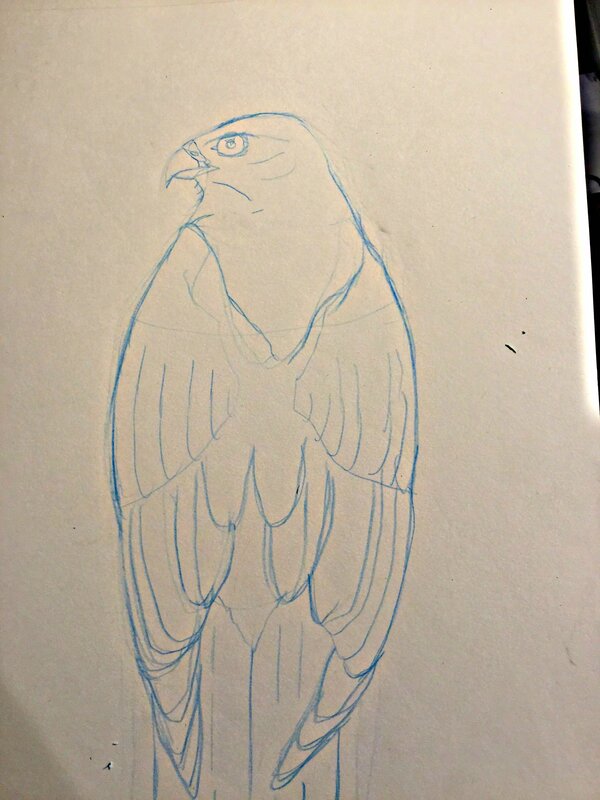 With sketching birds it’s easy for me to get in a rut of several similar poses back to back. I broke up a series of owl studies with this new-to-me composition. A Peregrine with a fresh kill. I didn’t draw in a background, because I was so startled by the new bird my pencil brought to the page I didn’t want to screw it all up trying to draw in a rock or something stupid like that. I’m going to work more on this sort of layout. I can write a story with a picture better than I can with words, more often than not. 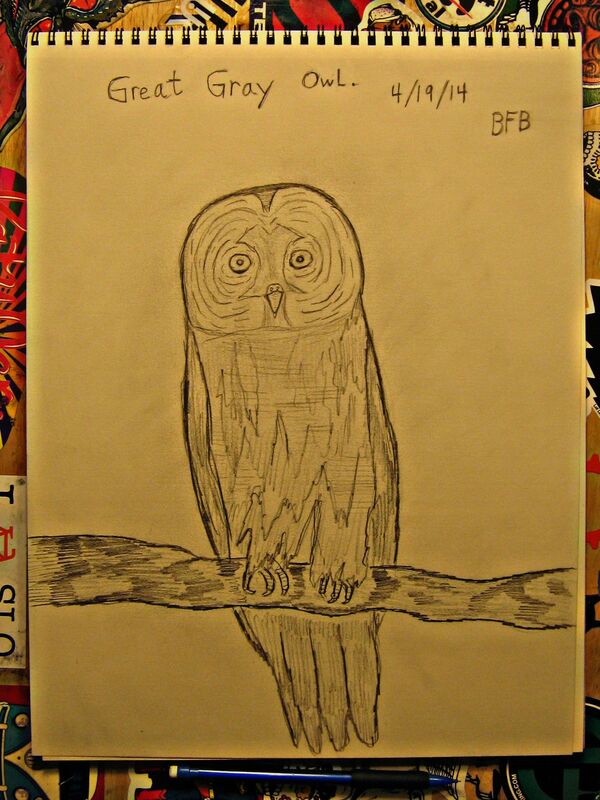 This picture, a story of my Wednesday night eating cold pizza, listening to jazz and drawing owls. and artichoke hearts are great on pizza. A quick lunch break sketch from work today. the shapes for bugs are simple compared to a flying red-tail, but they have their own challenges. Like antennae shape and the legs. 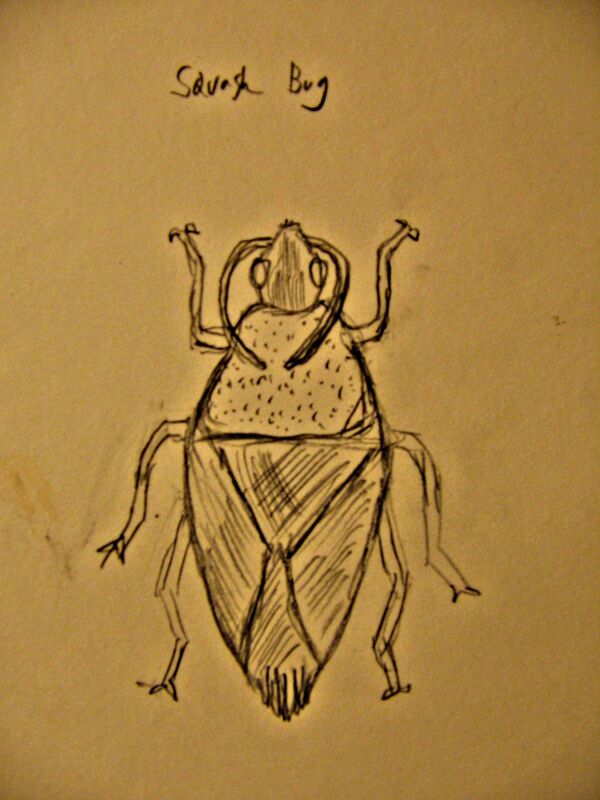 Insects are small for the most part and with that comes some detail difficulty. A good thing, like the birds, I have the rest of my life to practice getting them on paper. But the heart has its seasons, its evenings, and songs of its own. 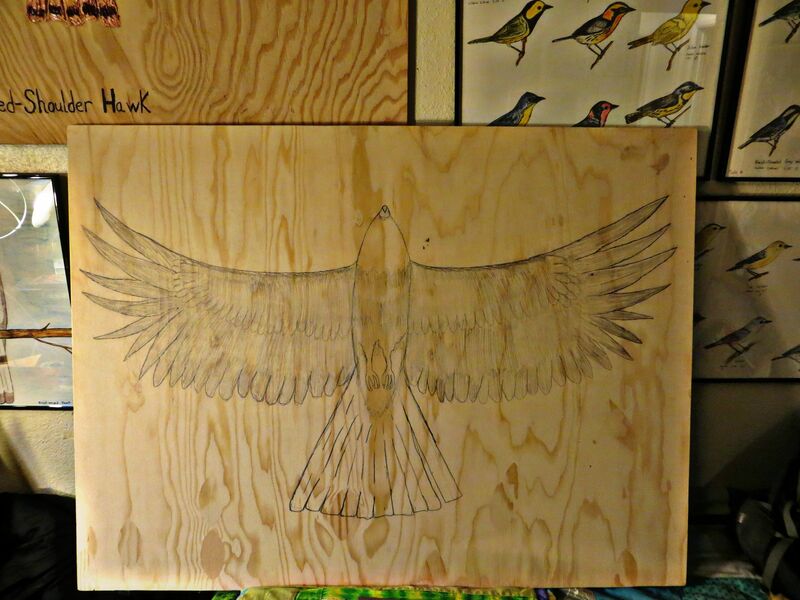 Some of my recent pencil work for the bird project. I figure I’m about a week out from having all five warbler plates finished and colored. I’m not sure how other artists celebrate finishing their projects, but I’ve got a few ideas of my own….probably drawing more birds. I have started doing studies for a Snowy Owl drawing. I hope it doesn’t take me as long as the Mocking Bird did. 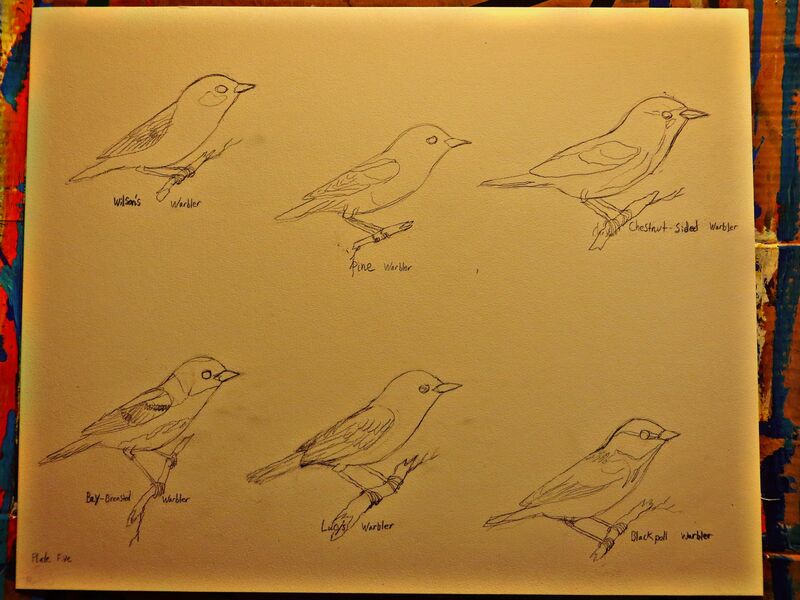 The fifth and final plate of warblers in pencil.